ABOVE: Josh Lamon (from left), Beth Leavel, Brooks Ashmanskas, Angie Schworer and company in a scene from the new musical comedy “The Prom.” Photo by Deen van Meer. THE PROM, the new American musical born in 2016 at the Alliance Theatre, opened on Broadway on Thursday night to positive reviews from The New York Times, Deadline Hollywood, Variety, the Hollywood Reporter and the Wall Street Journal. The show, the ninth Alliance production to reach Broadway since 1996, looks at what happens when four stars leave the bright lights of Broadway and take leading roles in a small-town controversy that’s making national headlines. The controversy: a shy lesbian in Indiana wants to take her date to the high-school prom. The creators — book by Bob Martin and Chad Beguelin, songs by Beguelin (lyrics) and Matthew Sklar (music) — have on their combined résumés The Drowsy Chaperone, that delightfully dizzy 1920s showbiz spoof, and The Wedding Singer, an underrated show about an entertainer so humbled he winds up in a dumpster. Tony Award winner Casey Nicholaw again directs and choreographs. Four leading actors seen by Atlanta audiences reprise their roles and lead a cast of 27: Tony Award winner Beth Leavel (The Drowsy Chaperone) as Broadway diva Dee Dee Allen, Tony nominees Christopher Sieber (Shrek the Musical) and Brooks Ashmanskas (Something Rotten!) as fellow actors, and Caitlin Kinnunen as the high-school lesbian named Emma. Atlanta-based actor Courtenay Collins also returns, making her Broadway debut as PTA President Mrs. Greene. The show has an open-ended run at the Longacre Theatre on West 48th Street. Here’s a recap of what the critics said. Atlanta’s Alliance, one of the largest regional theaters in the Southeast, has incubated eight musicals and two plays with Broadway aspirations. Eight have made the jump successfully. Two have yet to get there. This rundown begins with the most recent shows first and includes when each ran, how long and whether it received any Tony Award nominations. TUCK EVERLASTING. Opened in spring 2016 and had a five-week run (39 performances excluding previews). It received a Tony nomination for Gregg Barnes’ costume design. BRING IT ON: THE MUSICAL. Opened in summer 2012 and ran for more than five months (171 performances excluding previews). It received Tony nominations for best musical and Andy Blankenbuehler’s choreography. It toured nationally for seven months in 2011/12. SISTER ACT: A DIVINE MUSICAL COMEDY. Opened in spring/summer 2011. and ran for almost 1.5 years (561 performances excluding previews). It received Tony nominations for best musical, musical book, original score (Glenn Slater and Alan Menken) and featured actress (Victoria Clark as Mother Superior). It toured nationally for more than 1.5 years in 2012-14. COME FLY AWAY. Opened in spring/fall 2010 and ran almost six months (188 performances excluding previews). It received Tony nominations for Twyla Tharp’s choreography and featured actress Karine Plantadit-Bageot and toured nationally for 11 months in 2011/12. THE COLOR PURPLE. Opened Dec. 1, 2005, and ran for almost 2.5 years (910 performances excluding previews). 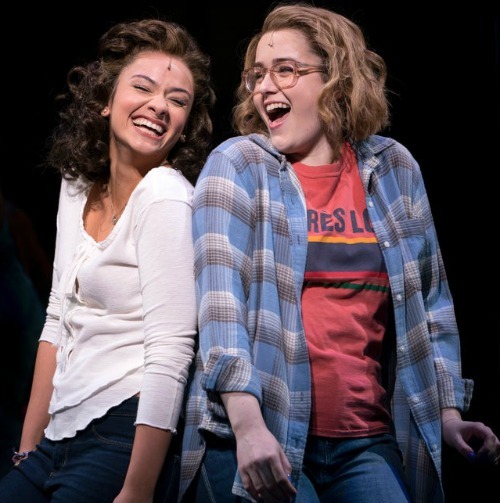 The show has 11 Tony Award nominations — for best musical, best book, best actress, best featured actor and actress, choreography, and scenic, costume and lighting design. LaChanze (as Celie) won for best actress/musical. A 2015 Broadway revival, which emphasized intimacy and storytelling, ran 14 months and won Tony awards for best musical revival and Cynthia Erivo’s Celie, plus nominations for director and featured actress Danielle Brooks (Sofia). Each version produced a national tour. AIDA (titled Elaborate Lives at the Alliance). Opened March 23, 2000, and ran for nearly five years (1,852 performances excluding previews). It won four Tony awards — for best original score (by Elton John and Tim Rice), best actress for Heather Headley’s Aida, Bob Crowley’s scenic design and Natasha Katz’s lighting design. It was nominated for costume design. Aida toured nationally for nearly 2.5 years in 2001-03 . THE LAST NIGHT OF BALLYHOO. Alfred Uhry’s comedy was commissioned for the 1996 Olympic Arts Festival and ran on Broadway for almost 1.5 years (556 performances excluding previews). It was nominated for the Pulitzer Prize, won the Tony Award for best play and earned three performance nominations — for featured actor Terry Beaver and featured actresses Dany Ivey and Celia Weston. SO LONG ON LONELY STREET. The Sandra Deer-penned comedy opened in spring 1986 and ran about 1.5 months (53 performances excluding previews). Two Alliance-incubated shows with Broadway aspirations have not made it yet. The 2014 musical Bull Durham announced a tentative spring 2017 opening, according to Playbill.com, but that date came and went. The 2012 musical Ghost Brothers of Darkland County by Stephen King and John Mellencamp also took aim at Broadway. A concert version toured the South and Midwest in 2013.